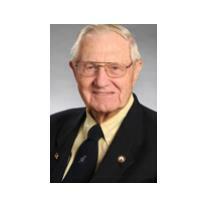 Former Georgia House of Representatives Member District 73, John Yates age 96 of Griffin, Georgia passed away on Monday, December 11, 2017 after a several months of declining health. Born to Lamar and Eunice Yates and raised on a farm in Spalding County, Georgia during the “Great Depression”, Representative Yates claims they didn’t know they were poverty stricken until the government told them. He graduated from Spalding High School in 1938. Years later while working he completed a BBA degree at Georgia State. At the time of him leaving his position, he was the last WWII veteran in the legislature. He and 3 of his 4 brothers served in WWII; 2 were prisoners of war and one was hospitalized, but they all came back home at the war’s end. Representative Yates entered the Army as a Private and 3 ½ years later was a Captain. His military service included extensive service during the Battle of the Bulge, noted as the greatest battle of the war. As a Liaison Pilot of a Piper Cub airplane, he adjusted artillery fire on the enemy. While flying over 200 missions near or over enemy lines, he was awarded 6 air medals and 4 battle stars. After the war Yates joined Ford Motor Company where he had a 35 year career as Manager of the Los Angeles Parts Distribution Center. Representative Yates was actually the first Republican candidate for the House ever elected in Spalding County. He began serving in 1989, was defeated in the next election, but won back district 73 the following term and remained in office until January 2017. His long service to the state and military experience worked to Representative Yates’ appointment as the Chairman of the Defense and Veterans Affairs Committee. He has always been a strong supporter of America and the military. Chairman Yates is a member of the Voice of Veterans, an organization that speaks to children about patriotism. He also held membership in the Appropriations, Reapportionment and Motor Vehicles Committees. His most important achievement has been enhancing education by gaining budget support for teaching at the Griffin Campus-UGA and similar support for Griffin Technical College know known as Southern Crescent Technical College and Gordon College where he was a member of the Gordon College Foundation. As Chairman of Defense & Veterans Affairs Committee, he worked tirelessly to help veterans, service men and women and their spouses. He was a member of Pomona United Methodist Church, Spalding County. In addition to his parents, he is preceded in death by his wife, of 66 years Annie Harris Yates, who passed away in November 2008. Mr. Yates is survived by children, Peggy Yates Odom and husband Bobby, Linda Yates Holmes, John Yates, Jr. and wife, Lyuba; grandchildren, Ethan Holmes, Casey Holmes, Justin Holmes and wife, Heather, Beth Harris and husband, Ron, Andy Odom and wife, Danielle, Tim Odom and wife, Jen, Bridget Manry and husband, Daniel, Laura Holdorf and husband, Nathan; great-grandchildren, Jayden, Jordan, Abby, Reagan, Samantha, Zach, Aeryn and Jacob. A visitation for Mr. John P. Yates will be on Saturday, December 16, 2017 from 12:00 pm until 2:00 pm at Conner-Westbury Funeral Home. Following the visitation, a funeral service will be conducted at 2:00 pm in the Chapel of Conner-Westbury Funeral Home. Reverend Gene Walton will officiate. Interment will follow at Griffin Family Cemetery. Please join the family and friends in honoring the life of John P. Yates by visiting www.conner-westburyfuneralhome.com and posting your tributes and memories.